This article originally appeared in the 2018-19 edition of Best Offices Ottawa. Read the full magazine here. 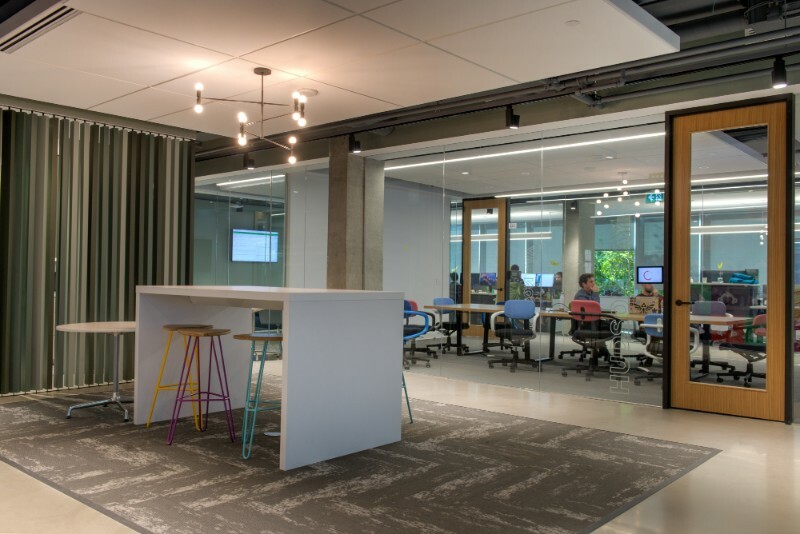 When a rapidly growing U.S. tech firm wanted to establish a second headquarters in downtown Ottawa, it took an organized and collaborative team to get the ambitious project completed – and thanks to an involved process with construction management firm MARANT Construction, SurveyMonkey’s new space was ready when they needed it. As Matthew DiCintio of MARANT Construction explains, the biggest priority for the client was the move-in date. 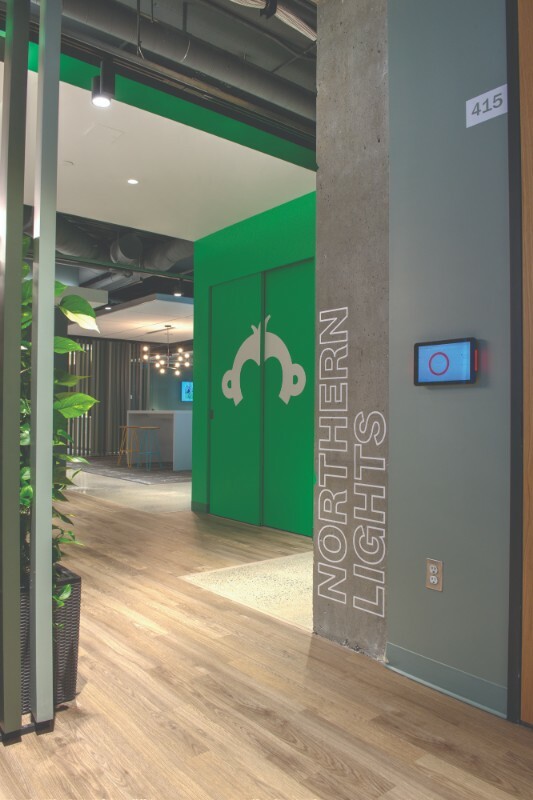 The new headquarters were modelled after SurveyMonkey’s existing location in San Mateo, Calif., but involved local Ottawa firms to ensure everything went according to plan. Operating under a tight timeline, the team was tasked with fitting up four floors inside a Laurier Avenue office building to meet the requirements of the expanding Silicon Valley tech firm. 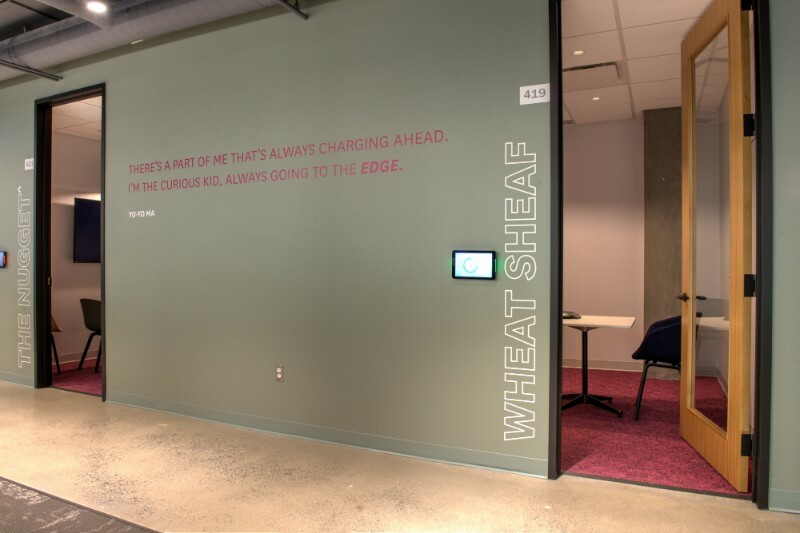 The end result was a colourful, open-concept design that includes a variety of collaborative spaces. Lynn Owen of Cresa, the project’s overall manager, says involving MARANT early on as the construction manager was essential to the success of the fit-up. By having MARANT join in on the design process, the team was able to offset many surprise costs that would have arisen from changes made after the design was approved. For example, the team identified areas of the design that would jeopardize the project’s budget, and made changes to those plans such as finding alternative finishes to help manage those costs. They could also place tentative orders with suppliers to make sure everything arrived on time. “The constructor can bring so much value up front. They have a different level of knowledge and skill,” says Owen. As well, MARANT was able to get a few key tasks out of the way before the tendering process, such as polishing the concrete floors and painting the exposed ceilings, taking at least a month off the construction process, says Owen. Gillean Woods of TRUform Interiors says having MARANT on board made the project flow smoothly. During the design process, she could consult MARANT directly on specific details, mitigating any possible questions during the tendering process. Once construction was underway, she says the site superintendent was collaborative and proactive, always beginning each meeting with an organized list of potential issues. “We just arrived at solutions overnight. They were just diligent and super proactive,” says Woods, adding that MARANT was accommodating when it came to all client requests. “Given the ambitious timeline, they never showed any resistance,” says Woods. DiCintio says MARANT made sure to begin the construction process with solutions for every foreseeable problem already in place. For example, he knew they couldn’t fit the nine-foot-tall doors or glass panels through the two small elevators in the building. So, MARANT rented 12 parking stalls outside the building and removed several panes of glass on each level to hoist the materials in through the outside. The periodic reviews that made Woods feel at ease were essential to the process, says DiCintio. “I think it’s something that’s often overlooked, and we made an effort particularly to follow that closely,” he says. DiCintio says the ambitious, playful design SurveyMonkey had in mind, which includes a first-floor cafe and patio, as well as kitchenettes on every floor, a games room and a fitness room, was a welcome challenge for MARANT. “The incorporation of cafes, billiard spaces, fitness areas and dedicated collaboration zones to spark brainstorming and creativity are becoming more frequent in progressive commercial office-type buildouts,” DiCintio says. “But we have constructed these spaces in the past, so supporting these nuances to the build is not something that concerned us at all,” he says. Architect Tim Murphy says those collaborative spaces were key to making the open-concept office approach work. 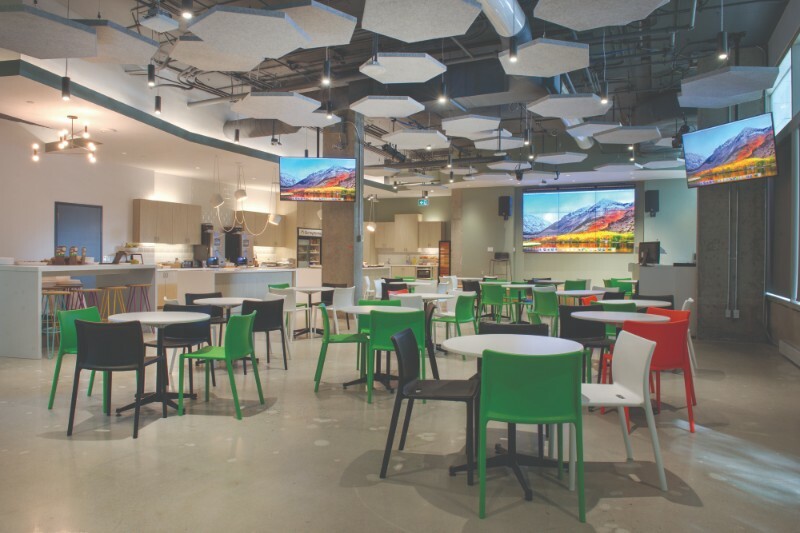 Though the design was based on SurveyMonkey’s San Mateo headquarters, he says having people on the ground in Ottawa made the implementation of the details go smoothly. He adds that MARANT was his first choice to manage the construction process. 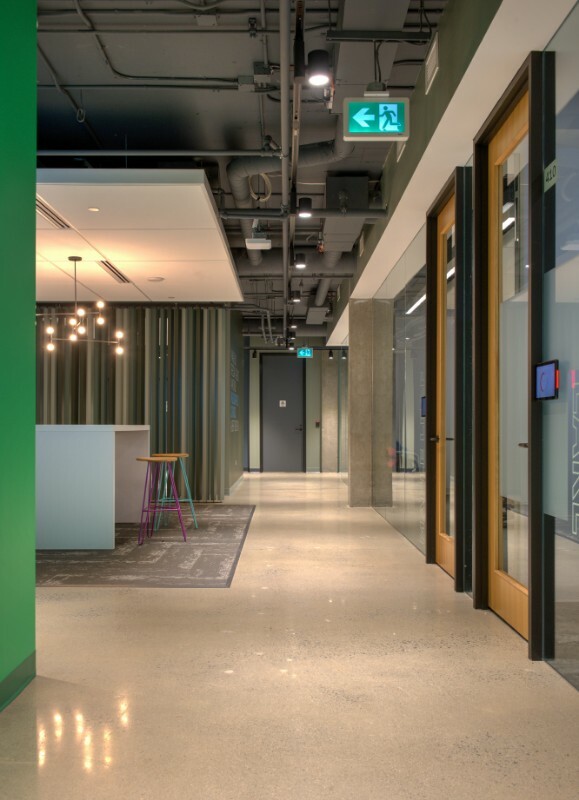 Christa Madore, SurveyMonkey’s Ottawa office coordinator, says the transition between the old and new spaces was a welcome change for the quickly-growing company, which now houses more than 150 people in its new headquarters. “(MARANT) kept us in the loop,” says Madore, who was responsible for getting feedback from staff on what they hoped to see in the new office. Greg Hitchmough, senior director of engineering at the Ottawa office, says having an office that clearly prioritizes employee happiness is one of the things that attracted him to the position – he’s one of SurveyMonkey’s newest recruits. Owen says that creating a good team at the beginning of the project was what made it such a success, and MARANT’s early involvement made all the difference. “We all have a common goal … it just creates a much better synergy having them on board right from the get-go,” she says.